Gates Timing Cam Belt Kit. 5/ 2006 - 7/ 2012. Diesel: 3.0 TDCI, 2.5 TDDi, 2.5 TDCI. Part Specification The table above is just a guide and there may be choice options on some models. 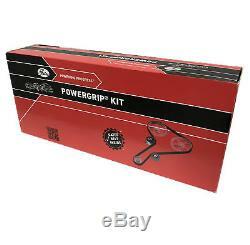 Kit Components: 1x PowerGrip Belt 5651XS, 1x Tensioner Pulley T43009, 1x Guide Pulley T42316. Equivalent Part Numbers GATES: 5651XS, GATES: T42316, GATES: T43009, BLUE PRINT: ADM57327, JAPANPARTS: KDD-329, SKF: VKMA 94626. The only way to be 100% sure that the part will fit your vehicle is to check the part number on your original unit matches one of the above. All of our products are sourced directly from our range of approved factories. The factories that we use supply some of the leading car parts suppliers in Europe and America. All of our parts are subject to quality testing and are ISO TS16949 certified, we also search to make sure that our approved manufacturers use the latest technologies and materials available. If a part is faulty a replacement will be sent out after the return and testing of the old unit. Labour claims & consequential loss claims are never accepted. The item "Gates Timing Cam Belt Kit Fits Ford Ranger (2006-2012) 2.5 TDCI 4OW" is in sale since Thursday, August 30, 2018. This item is in the category "Vehicle Parts & Accessories\Car Parts\Engines & Engine Parts\Belt, Pulley & Tensioner Kits". The seller is "rtgroup11" and is located in PR25 3US. This item can be shipped worldwide.